committee have deemed to be of significant importance to the wider Navy community. Details of each event will be published each year when known. Navy League of Australia Victoria Division. The Battle of the Coral Sea, fought from 4–8 May 1942, was a major naval battle in the Pacific Theatre of World War II between the Imperial Japanese Navy and Allied naval and air forces from the United States and Australia. The battle was the first action in which aircraft carriers engaged each other, as well as the first in which neither side's ships sighted or fired directly upon the other. In an attempt to strengthen their defensive positioning for their empire in the South Pacific, Imperial Japanese forces decided to invade and occupy Port Moresby in New Guinea and Tulagi in the southeastern Solomon Islands. The plan to accomplish this, called Operation MO, involved several major units of Japan's Combined Fleet, including two fleet carriers and a light carrier to provide air cover for the invasion fleets, under the overall command of Shigeyoshi Inoue. The U.S. learned of the Japanese plan through signals intelligence and sent two United States Navy carrier task forces and a joint Australian-A merican cruiser force, under the overall command of American Admiral Frank J. Fletcher, to oppose the Japanese offensive. 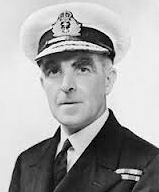 The Australian involvement was made up of the cruisers HMAS Australia & HMAS Hobart and led by Australian Rear Admiral John Crace. After an unopposed landing, a mixed force of German reservists and half-trained Melanesian police mounted a stout resistance and forced the Australians to fight their way to the objective. After a day of fighting during which both sides suffered casualties, Australian forces captured the wireless station at Bita Paka. The battle was Australia's first major military engagement of the war and the only significant action of the campaign; in its aftermath the remaining German forces on New Britain fled inland to Toma. Following a brief siege there the German garrison capitulated, ending resistance to the Australian occupation of the island. 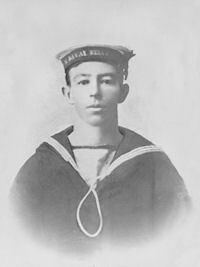 At Bita Paka Australia suffered their first casualty of World War I, with Able Seaman Billy Williams mortally wounded. The 111th Seafarers Memorial Service will be held at St Paul’s Cathedral at 10:30 on 21 October 2018 and it will be followed by the Navy Wreath Laying Service at the Cenotaph at the Shrine of Remembrance, Melbourne at 12:30. All Ship and Unit Associations are encouraged to support the Navy Victoria Community. 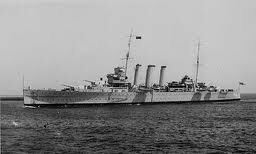 HMAS Goorangai had been on operation since the 8th of November 1940 in Bass Strait following the discovery of minefields laid in the area the month before by German Merchant Raiders. The resultant minefields had sunk the US merchant vessel City of Rayville, and the British steamer Cambridge on the 7th and 8th of November. During the day on November 20, 1940, the 230-ton Castle Class auxiliary minesweeper re-entered the bay for supplies of fresh victuals at Queenscliff. At around 2030 she left Queenscliff for her regular mooring at Portsea. It was during this move she collided with the 10,346 ton merchant ship MV Duntroon travelling at top speed with a following tide near the Popes Eye light in Port Phillip Bay. The little ship, a member of Minesweeping Group 54, travelled slowly across the bay showing its regular steaming lights while Duntroon’s lights had been adjusted for its transit though Bass Strait. Once the bows of Duntroon loomed high over her amidships, her WW1 veteran skipper Commissioned Warrant Officer David McGregor RANR and his entire crew of 23 were doomed. The Duntroon stopped and lowered two life boats to commence a search for an hour and a half. The search was then taken over by the Queenscliff life boat, the picket boat MARS and others while the Duntroon returned to Williamstown for repairs. The search was to no avail with only minor flotsam recovered from the water. Only six bodies were ever recovered and this was through the salvage / demolition of the wreck. It was the RAN’s first loss in WWII and its first surface ship loss in any era (the only WW1 losses being the submarines AE1 and AE2). Goorangai was also the first of three RAN surface ships lost with her whole crew. 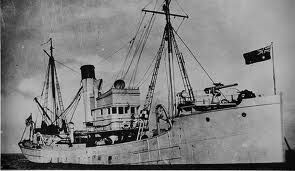 Goorangai was one of many former fishing trawlers requisitioned from Carlo Camaniti's fishing fleet, Cam and Sons Ltd of Balmain, Sydney and the first of two to be involved in notable wartime tragedies. The second being the extraordinary events surrounding the sinking of HMAS Patricia Cam by a Japanese float plane. Goorangai had been built at the State Dockyard, Newcastle (NSW) in 1919, for a short-lived State Government fishing venture and was requisitioned from Cams at the outbreak of the war in September 1939. Goorangai's wreck, laying in only 15m of water was demolished over the following months. She was laying on the edge of the shipping channel, regarded as a shipping hazard. Although much effort was put in by Les Nangle, Sam Benson and Ben Wadham from as early as the 1960’s it became a Historic Shipwreck site in 2015 due to the 75 year shipwreck rule. The site remains popular with divers, and steel plates are scattered over a 200 sq m area of the seabed. 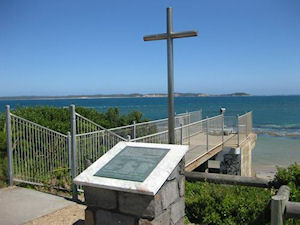 As the RAN now begins to look back more on its history, in 2006 a WW11 mine with a plaque attached was unveiled at a memorial service in Queenscliff Reserve, recalling the memory of Goorangai and those lost.